1. Equalized Grand Lists (GL) are used for apples-to-apples comparison between VT towns. Where did Montgomery’s GL value rank in 2014 among Franklin County’s 15 Cities/Towns? 2. According to the 2014 Town Report, average Vermont per pupil spending is $14,009. Montgomery’s per pupil spending is less than _____ of the State’s 228 school districts? Last year at this time I was remarking on the many different things going on at the same time and the challenges of keeping everything on track. We were in the home stretch of fund raising and anticipating the start of our biggest restoration effort yet. What a difference a year makes! In a few months we should be putting the finishing touches on the West Wall Project and opening the Hall up for normal use again. Aside from the new stone foundation and straightened fascia, trim and clapboard you may not be able to tell we've done anything. Our venerable building's bones have been repaired and covered with sheathing and three of the tie beams now sport reinforcing timbers that help carry the load and stiffen the truss. Custom steel brackets were added where required. 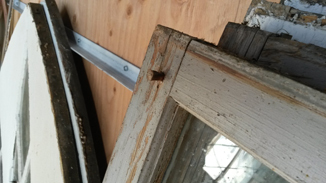 All timber connections were re-established with scarf joints and other traditional joinery. We owe a debt of gratitude to Jan Lewandoski and his crew (timberframing and project management), Charlie Fichman and his crew (foundation), Leonard Spencer (plaster and painting), Larry Ribbecke (stained glass windows), and Jeff Fellinger (clear lancet windows). Our own Men with Tools, Boardmembers, and volunteers also pitched in repeatedly to keep the project moving. None of this would have been possible without the fund raising during our capital campaign and donations from all of you. Several people have admitted to me that they had their doubts we could pull all of this off. So did I. Often times it seems these things require a leap of faith. Our success is a tribute to all of us and to the community we all serve. So what's next? We need to attend to the metal roof and top two sections of the tower (louver trim and clock face). But that's another newsletter. This year's commemoration will be at the old (lower) Montgomery Center Cemetery. It will be on May 25th at 10:00 a.m. It will feature a speaker, roll call, honors by American Legion Post 42, and refreshments. Please join us to pay our respects to those veterans interred in Town. The deadline for applications for the MHS Annual Scholarship grant is May 1st. An application was mailed to all eligible Montgomery high school seniors and it's also available on our web site. 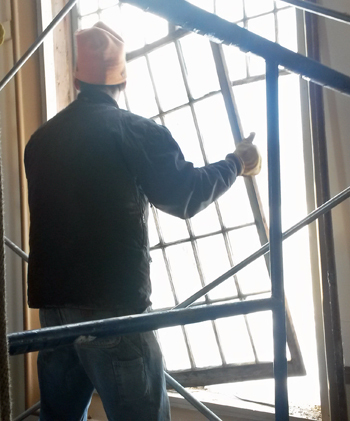 The two clear glass lancet windows on the west wall were removed without incident the first week of February and taken to Jeff Fellinger's Newport workshop for restoration. 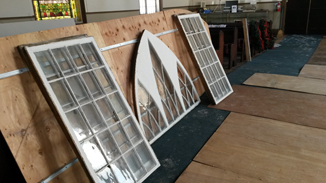 We expect them to be reinstalled by May 1st, followed shortly thereafter by the re-installation of the Stained glass windows, final plastering and painting, and re-installation of lights, lanterns, and pews. There are a few hard copy, and paperback, copies of the updated Town history, signed by Bill Branthoover, Joe Sherman, and Jo Anne Bennett, available. They can be purchased on line, at Lutz's Automotive, or at the Town Office. Discounted prices are available for members. If ordering on line please send us a separate email specifying you want the autographed copy. This year marks the end of Civil War 150th Anniversary commemorations. The last person credited to Montgomery to die during the war was Moris Braman who served in the 11th Vermont Infantry. He enlisted in October of 1863, was captured and made a POW in July of 1864, paroled in February of 1865 but died on April 1st, just 8 days before Lee's surrender. He is buried in Montgomery Center. The Longley Bridge design work is to be completed by the engineers by the end of November this year. It will preserve the Town Lattice design used by the Jewetts but be beefed up with larger truss timbers, more trunnels, and some laminated beams integrated into the floor to achieve a load rating of 20 tons. Construction is planned for 2017. 1. B. 10th, The value of Montgomery's equalized grand list is larger than Richford's, Franklin's, Fletcher's, Berkshire's, and Bakersfield's. 2. D. 211, Montgomery's per pupil spending is among the lowest in the State. You should receive a letter soon, if you haven't already, asking you to renew your membership or become a new member. Annual membership donations are used for our operating expenses and programs. You can mail us a check with the handy return card and envelop or join via our website and make your membership donation using a credit card (processed by Paypal) or a Paypal account transfer. No matter how you do it we thank you in advance. Your support makes all the things we do possible. This year's MHS Annual Meeting will again be part business and part party as we unveil the newly restored west wall. We will be having social time starting at 3:00 p.m., a re-dedication, then the business meeting, and a chicken barbecue buffet served at 5:00 p.m. We will only have food for 50, so please call or see Elsie for reservations at 326-4528. Steve Hays is retiring after 25 seasons as director of the MHS's "Concerts by the Common" and is taking a well deserved rest. We can't begin to thank him enough for this signature program that has won acclaim, developed membership, and entertained us all on a warm summer night. The Board is exploring our options but unless we can find a new volunteer director or develop some alternate programs/events this 25 year tradition must come to an end. If you have ideas for programs and are willing to manage organize and direct them, please contact any member of the Board. April 1925: Covered bridge builder Savanard Jewett dies. May 1995: MHS revives annual Memorial Day commemoration. June 1833: Montgomery voted to establish one school district for every seven farms. The Town-appointed committee to erect the Hectorville Bridge has proposed to locate it at the Rec Center as part of a park & information kiosk. They've secured State and Town funding for a feasibility study which should refine the design and cost for any future project there. MHS Board member Pat Farmer is part of the group. The State Division for Historic Preservation is due to review the MHS sponsored, application for the former Baptist Church to be placed on the National Register for Historic Places this Spring. The Society will purchase the NRHP plaque as soon as it's officially announced. The next order of engraved walkway bricks will be placed soon. If you would like to order please contact Pat Farmer. You can also order on line at out History for Sale link. You'll also find books and other merchandise there too.